All-inclusive vacations are simple. I’m drawn to them, especially as a parent. I like to plan. I like to have an itinerary. I like to have a price. Although I always wanted to visit Southern Africa, that was one of the things that worried me. How do you plan an entire African adventure? It’s not like arriving at a beach destination where you don’t even have to leave the resort to have a great vacation. Part of the African experience is traveling around the country and exploring the wild. ATI Holidays creates tailored adventures to meet all of your specific budget and interest needs. From pick-up at the airport to dining, activities and meals, they think of everything. With one call, you can have an all-inclusive, worry-free vacation. The total cost of my trip, from pick up at the airport to drop off, would cost $1,539, excluding flights, a few meals, and personal purchases like souvenirs. ATI Holidays can make your African safari bucketlist dreams a reality and at a price you can afford. We landed in Windhoek International Airport and were escorted to Rivendell Guesthouse. Located in a quiet suburb of Namibia’s capital city Windhoek, Rivendell was a homely, comfortable setting before heading into the wild. Although they do offer a swimming pool, it was far too cold for me to take a dip. Winter in Namibia is a lot colder than I anticipated. The warm water bottles that are delivered to the room during turn-down are a welcomed addition to the cold nights in Windhoek. Our self-drive vehicles were delivered to the guesthouse and a detailed explanation of the ins and outs of driving in Namibia, including how to change a tire, was given. After our breakfast at Rivendell, we departed Windhoek and made our way further north to the world renowned Etosha National Park. The game viewing in Etosha was excellent. Herds of elephants, antelope, giraffes, and zebras crossed our path as if we were part of the group. I had never felt that close to the wild. I was in the pages of National Geographic. As the sun set, we left the park and headed toward Etosha Safari Lodge. Built atop a hill with bush views, I marveled at what the area had to offer. We stayed at Etosha Safari Lodge for two nights while we were exploring the park. I was only disappointed when I had to leave. The large wooden windows and the veranda of my guest chalet left me speechless. I had envisioned what it would be like to stay in Namibia but this was even more of a dream than I thought possible. There were actually giraffes roaming the property freely. It wasn’t a movie; this was my real life. Just outside of the Etosha National Park, we visited Huab Lodge. The irregular thatch roof of the main building mirrors a mountain on the opposite bank and the stone and thatch bungalows spread along the elevated north bank of the river, ensuring a private and magnificent view for all guests. Although it was unbelievably stunning and peaceful, what surprised me the most about my time at Huab was the family environment the hosts created. Meals were enjoyed with the hosts at the family table, and in true Huab Lodge tradition, a variety of local wines were presented ceremoniously for us to appreciate and enjoy. It was the ideal setting to make friends and exchange stories. I felt like I was home for Thanksgiving. We enjoyed an early morning guided walk and a game drive where we were given the chance to test out our new tire-changing skills. Luckily, David was a professional and had it covered. From there, we headed toward Grootberg. I often wondered if Heaven was for real and my question was answered in Namibia at our next destination. Perched on the lip of the Grootberg Plateau, with an infinite view down the Klip River Valley, lies Grootberg Lodge or Heaven on Earth. If you are traveling to Namibia, this place can’t be missed. It is magical. It is unearthly. It is Heaven. This area is home to the Himba, a traditional, nomadic African tribe. From Grootberg Lodge, we visited the Himba community living among the majestic Makalani palms at Palmfontein. Spending the morning with the tribe and a translator, we were able to learn about their unique customs and techniques. I often find myself drawn to children and visiting with the Himba was no exception. Regardless of language or culture, I can relate to children on another level. It warms my heart that they are drawn to me as well. Seeing the world through the eyes of a child is beautiful. Sadly, I was only able to experience the sunset at Grootberg twice before leaving but I did manage to take advantage of a pool view photo opportunity before the sun hid behind the mountains. The water was freezing; I shivered and yelled as my feet submerged in what felt like ice but it was worth it for this shot. Doro Nawas Camp situated on a rugged, rocky hill on the edge of the dry Aba Huab River, rolled out the green carpet for us! From the accommodations to the dining to the daily activities, Doro Nawas Camp left me starstruck. 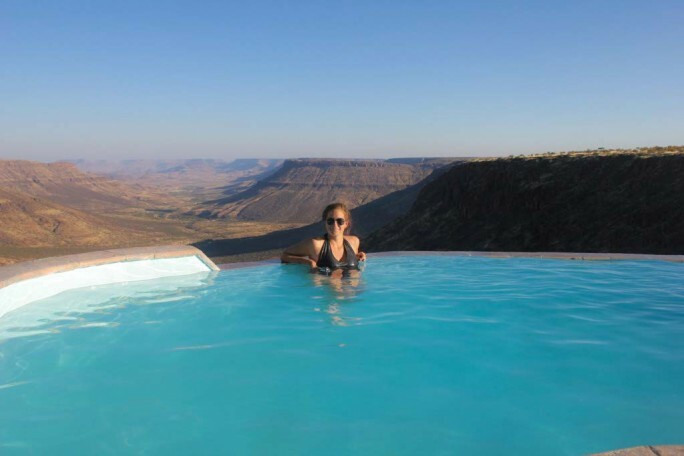 Perched atop a rocky knoll, the unspoiled views of the Etendeka Mountains were breathtaking, but it was the massive suites with a veranda for stargazing or sleep-outs that left me speechless. This was the reason I came to Africa! Experiences like these don’t come along often. I wanted to soak it up and mingle with the stars! Before I turned in, or should I say rolled my bed out, for the night, dinner was in the agenda. Told to dress warm, I figured we’d be dining on the patio overlooking the mountains but the staff had something prepared that was even beyond my exotic, wild imagination. We drove 20 minutes to a private dinner under the stars in the Namibian plains. Candles lit the path to our table, our backs to the sounds of the wild. This is the place of fairy-tales. Do people actually get to live like this? It didn’t even seem out of the ordinary to the staff. When I asked, they said they do it on a regular basis for their guests, especially for proposals or anniversaries. Take notes men! This is how you should treat your partner. That night will remain on the top of my best dinners for the rest of my life. 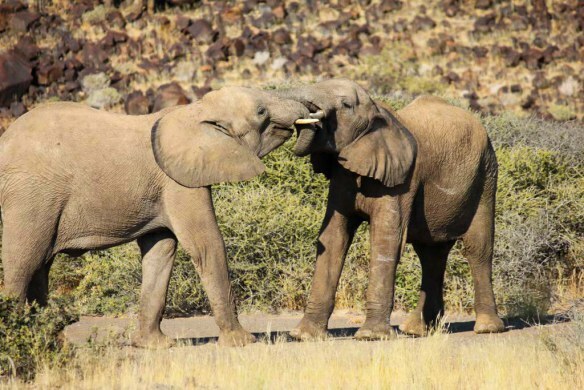 As a final “hurrah” from Doro Nawas Camp, we finished our stay there with an elephant safari. We started the morning at 5:30 am and went elephant tracking. Just when we thought we’d go back without a sighting, our guide spotted something on a mountain in the distance. It was a miracle. I still don’t know how he did it. Like pulling a rabbit out of a hat, he made them appear as if from dust. There were at least twenty of them. Tears of joy filled my eyes and I pretended it was from the wind. I had envisioned this for so long and to actually be surrounded by my greatest travel dream, I was elated with happiness. I knew, and know, that anything is possible. My last night was spent at the Erongo Wildnerness Lodge. Set in the foothills of the Erongo Mountains, this small, 10-room lodge blends into the surrounding boulder-strewn landscape. Our morning walk left me breathless. Namibia was life-changing. It was a transformation of the senses, an enlightenment. Doesn’t Namibia seem more realistic now? I always put it off because I had no idea it was so affordable. Thanks to ATI Holidays, all of your African safari dreams can come true. Those pictures are absolutely wonderful. I would love to go enjoy these kind of places pretty soon. Wildlife is stunning and unreal.